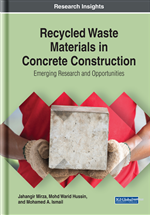 This chapter discusses the utilization of wastes in the form of palm oil fuel ash, oil palm kernel shell, and oil palm fibre in the production of mortar mixes as a part of new and innovative materials in construction industry. Detailed introduction is provided followed by a clear description of each waste and its effect when added to mortar mixes. Furthermore, a research study on the effect of palm oil fuel ash, palm oil kernel shell, palm oil fibre on mortar properties was carried out and the experimental program details are given under four subtitles. Splitting tensile strength and flexural strength were performed to test the engineering properties of mortar containing different types of waste. Results and discussion are provided for additional grasp. It is concluded that the inclusion of high-volume palm oil biomass waste can produce sustainable mortars with high strength and with more durability performance. When properly designed and manufactured, concrete has become a predominant building material in the construction industry due to its excellent mechanical and physical properties. More than 10 billion tonnes of concrete are produced annually. As it has been estimated that by the year 2050, the rate of world’s population will increase from 1.5 to 9 billion, directly increasing the demand for housing and concrete materials which are estimated to be 18 billion tonnes by 2050 (Meyer, 2009). However, with the large quantities of concrete being produced, there are consequences that will affect the environment. It has been found that approximately one tonne of carbon dioxide (CO2) is released with every tonne of cement produced. Overall, around 5% of total CO2 emission all over the world is contributed by the cement manufacturing industry (Worrell et al., 2001). Due to the implementation of the Kyoto protocol in February 2005, countries all over the world must reduce their greenhouse gas emissions (GHG). Therefore, the major challenges are to reduce the CO2 emissions arising from cement manufacturing industries. Previously, researchers have focused on finding materials that have similar properties as cement are yet more sustainable and affordable. Since cement is the major building materials, finding and substituting a material that would reduce the overall cost is necessary. The need towards sustainability and sustainable environment has made the use of pozzolanic material in construction popular. Within the past few years, natural and industrial wastes have been used in construction materials namely, pulverized fuel ash (PFA), ceramic tile waste, ground granulated blast furnace slag (GGBFS), metakaolin (MK), silica fume (SF), palm oil fuel ash (POFA) and rice husk ash (RHA), etc. Their usage as construction materials have become quite prevalent since they offer advantages in terms of strength and durability (Meyer, 2009; Samadi et al., 2015; Ismail et al., 2013; Ramadhansyah et al., 2012). In addition, these pozzolanic materials have also been proven to improve the properties of concrete and reduce the hydration temperature and hence make massive construction easier. Palm oil fuel ash (POFA) is generally known as one of the pozzolanic materials from natural waste. By 2014, Malaysia had recorded a staggering 5.39 million hectares of oil palm plantations, an increase of 11.0% from the previous 4.85 million hectares in 2010 (MPOB, 2015). Malaysia is the second largest producer of crude palm oil in the world, consequently producing a large amount of oil palm waste. It is estimated that “the total potential palm biomass from 4.69 million hectares of oil palm planted area in Malaysia in 2009 is 77.24 million tonnes per year comprising of 13.0 million tonnes of oil palm trunks, 47.7 million tonnes of oil palm fronds, 6.7 million tonnes of empty fruit bunches, 4.0 million tonnes of palm kernel shell and 7.1 million tonnes of mesocarp fibre (all dry weight)” (Ng et al., 2011; Zwart, 2013). These wastes are usually used as fuel in oil palm mill to generate electricity and produced approximately 5% another solid waste namely, POFA (Tay and Show, 1995). In Malaysia alone, about 3 million tonnes of ashes are generated annually (MPOB, 2015). Even though the wastes have been used for other purpose, they are still left and dumped in open field creating environmental and health hazards. Therefore, the utilization of oil palm biomass waste presents an opportunity to make the industry more environmentally safe and sustainable.